Since the Cardinals played the Opening Night game on ESPN this year, on actual Opening Day I had my pick of games on MLB.tv. By the time I got home from work, the Indians and Blue Jays were tied in the 9th inning. “Oh, I’ll just watch this quick dramatic conclusion,” I thought. Then it turned out to be the longest Opening Day game ever played. It went on so long, in fact, that the benches for both teams saw a lot of work. Which brought in Omar Vizquel. Who yesterday turned 45. Carmelo Anthony’s reputation as a Knick has been up and down so often in the last season and a half it will give you whiplash. First he was the franchise savior. Then people wondered if he was too selfish to gel with Amare’, especially after the advent of Linsanity. It was just last month that he had to downplay rumors he wanted out of New York. In the last couple of weeks, however, the Amare’-Melo pairing has been clicking the way it did in every Knicks’ fans head last February and the Knicks are in the process of nailing down their hold on the 7 seed. Suddenly Melo’s “new” leadership and resiliency are the talk of the town. Averaging 30 points a game for almost a month will have that effect. Personally, I think Melo’s been an unfair target for most of the New York media and that his “poor attitude” early in the season was largely due to his injuries. 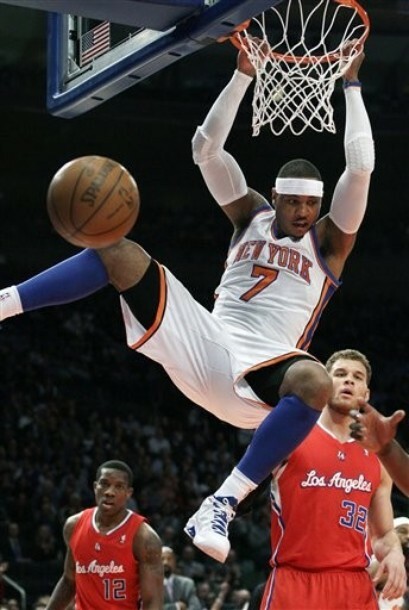 But I can’t wait to see what happens next on As Melo’s Rep Turns! 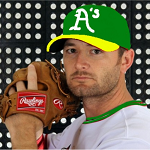 Unfortunately, Thompson was designated for assignment by the A’s this week and, well you’ll just have to see the results for yourself. Though if the pitching thing doesn’t work out, Thompson could have a nice career as the guy who has to digitally alter baseball card photos. That is an impressive use of the paintbrush tool on that A. This entry was posted in Baseball, Basketball, Cleveland Indians, Games Mistress, Hit and Run, Los Angeles Angels of Anaheim, MLB, NBA, New York Knicks, Oakland Athletics, Opening Day, Toronto Blue Jays, Twitter Theater, Wow I'm Old by Tres Geek. Bookmark the permalink. Holy crap! Vizquel is still playing? I could have sworn he’d retired a few years ago.